November 18, 2010 — I like the Smithsonian National Air and Space Museum in Washington, DC, just fine. You get to walk through a rocket, see the actual Enterprise filming model from the original Star Trek television series, and recieve a museum-specific toy with your Happy Meal at the in-museum McDonalds. 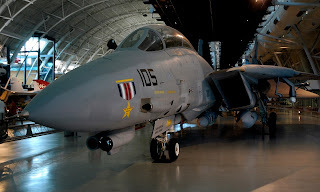 However, in my opinion, even better than the Air and Space Museum is its annex museum in Chantilly, VA, just 30 miles away. 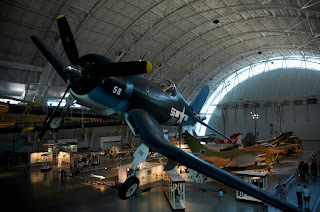 Built in 2001 and named after a billionaire donor, the Steven F. Udvar-Hazy Center (pronounced “oodvaar hahzee”—the hyphen is silent) looks more like an active hangar than a museum. 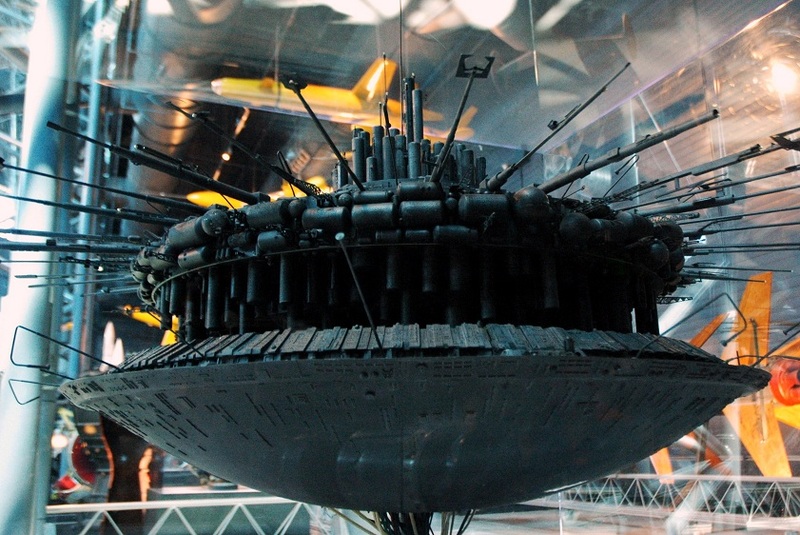 The main reason for that is because it is a hangar, a couple of them actually, but also because the air- and spacecraft on display are just parked right out on the floor or hung from the ceiling. It looks like they could take off as soon as they get the call from the President. As a result, you can get ridiculously close to everything (even the vehicles suspended from the ceiling, thanks to an upper walkway). And that “everything” that you’re ridiculously close to…is awesome. 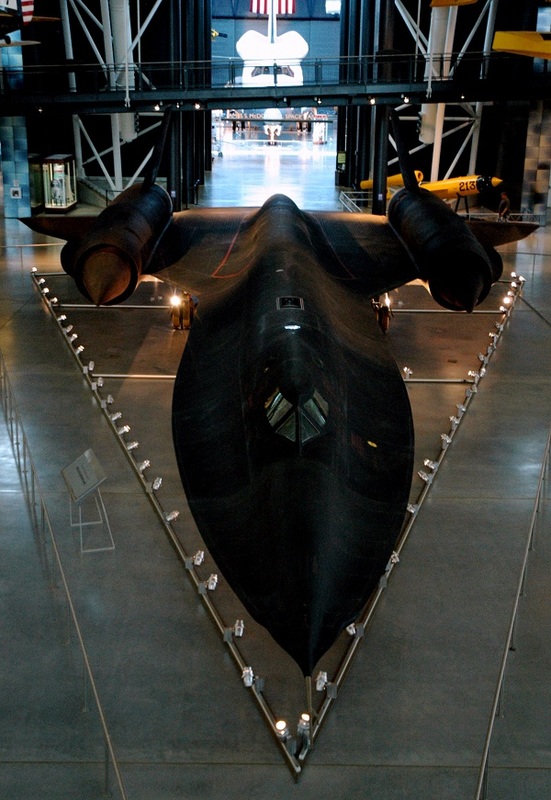 The first craft you encounter upon entering the Udvar-Hazy Center is the amazing SR-71 Blackbird, the superfast stealth reconnasiance plane that found its niche during our coldest of wars and became the symbol of everything fascinating about the progress of military science to those growing up in the heyday of this bird. Oh, and it fueled rampant rumors of alien technology implementation gleaned from the Roswell incident. Udvar-Hazy doesn’t mention anything about that latter on the exhibit placard, though. The sleek black piece of airborne spyware still looks futuristic even though the concept was developed half a century ago. 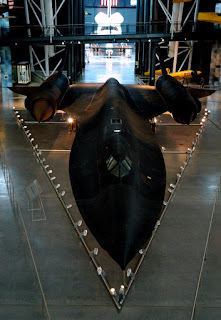 According to Wikipedia, there are only 20 of them left, and you can walk all the way around the Udvar-Hazy Blackbird, seeing it up close like no radar has ever been able to do. Actually, it deserves its own photo essay. Here’go. 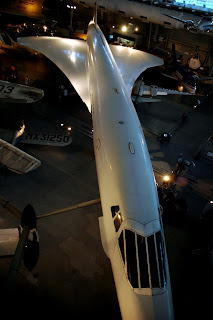 This particular flight piece was active for 25 years before being flown across the country to retire at the museum, setting an air speed record while doing so. I then imagine the pilot jumping out, flipping the keys to the nearest Smithsonian curator, grabbing a hot girl from the press corps, and heading off into the sunset on a motorcycle while Poison’s Nuthin’ but a Good Time played from some invisible audio source. My imagination is tainted by every cheesy movie I’ve ever watched. Behind the Blackbird, in an amazing line of sight that beats most cosmic alignments and looming like some gigantic pursuing predator, is the actual Enterprise space shuttle. 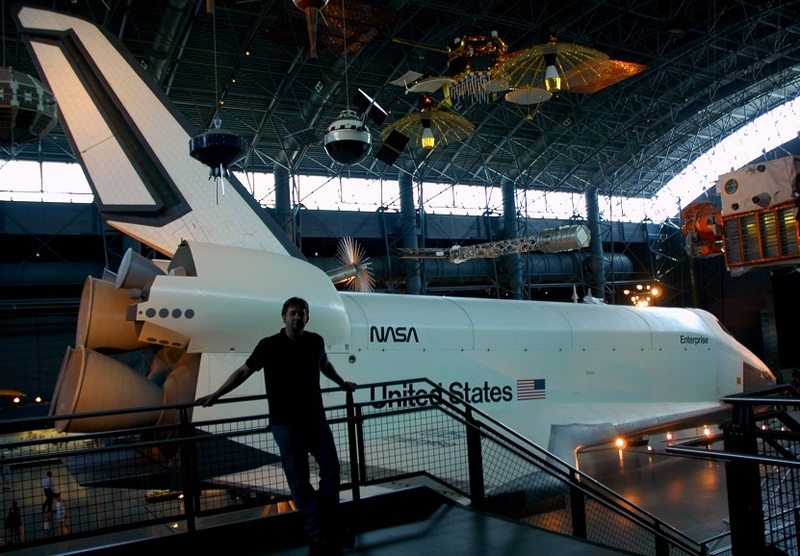 This white and black behemoth is the original space shuttle. 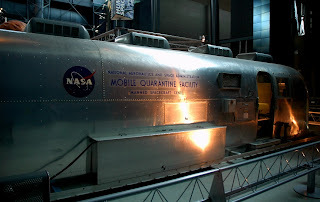 Actually, this beast never made it past the upper atmosphere, being only a test vehicle for the design, but it did make it possible for other shuttles to make it into space. Here’s a photo essay for it. Speaking of science fiction, the Udvar-Hazy museum is currently displaying, alongside historical World War II craft and pioneering space technology, an exhibit on the second Transformers movie, Revenge of the Fallen. You didn’t know that Michael Bay had contributed invaluably to the advancement of aeronautics? Way to judge a man by his horrible, horrible movies. 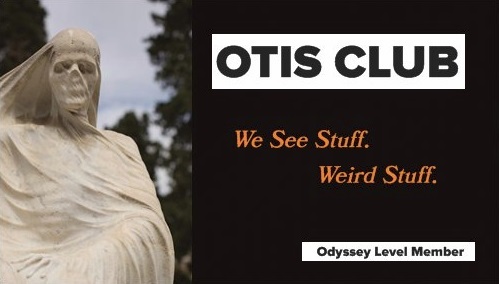 Really, though, the exhibit is there because the film actually had a pivotal segment filmed on-site in the museum. In fact, the movie even incorporated the SR-71 itself, and transformed it into the character Jetfire. That was probably the only part of the entire movie that was a great idea. Of course, they then went ahead and executed the idea in an absolutely cartoonish way. 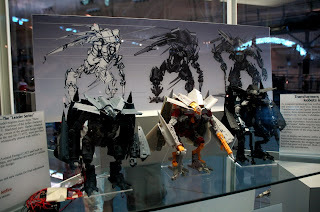 I mean, part of the Blackbird transformed into a walking cane, for goodness’ sake. Still, the exhibit is kind of cool and features props and costumes from the movie, vintage and modern Transformers toys, and a television playing some of the computer animation from Jetfire’s transformation scene. Definitely, if you happen to own a plane that was turned into a robot in a movie, you should tout it, even if it was a horrible movie that polluted the joys of your childhood a bit. That’s probably more our fault than its, though, I guess. What the heck…here’s another photo essay. Besides the Transformers display, there are a few other science ficiton items in the musuem worth noting. 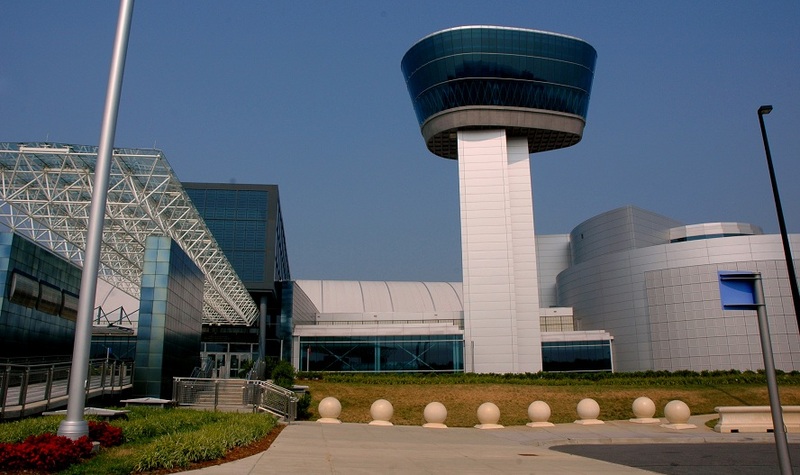 For instance, the George Lucas-autographed R2-D2 mailbox that I wrote about here after seeing it in the National Postal Museum apparenly ended up at Udvar-Hazy since then. Also on display is the rocket-shaped World Science Fiction Society Achievement Award given to Willy Ley, a Golden Age science fiction author and influential rocketry propenent. 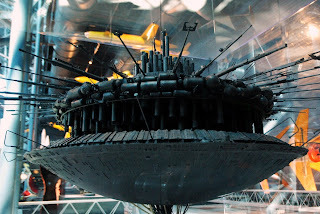 Most fascinating SF-wise is the presence of the original model for the mothership in Steven Spielberg’s Close Encounters of the Third Kind, which was crafted out of random model parts and features a hidden R2D2 in its construction, among other items. Extremely detailed and about the size of ten pizza boxes stacked on top of each other, it’s an engrossing piece of work, even without all the hidden items to look for. Unfortunately, seeing it was kind of depressing. One, because seeing it firsthand emphasizes that CGI technology all but ensures that we won’t have artifacts like this in the future. But mostly because it made me go back and re-watch the movie for the first time in a decade or so, and I found the story more flawed than I remember. I mean, the movie was likeable, featured a compelling cresendo, and had a few individual scenes worth recommending by themselves, but…I don’t know. I’m not sure if I should be outting myself about this. Jaws still holds up, right? Anyway, a great ship concept regardless. Photo essays all around. 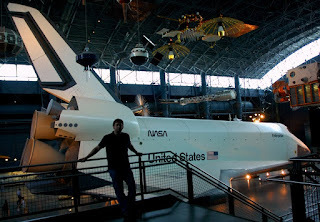 Of course, those are just the few science fiction exceptions to the general real-world science that make up most of Udvar-Hazy. The Enterprise hangar is devoted mostly to space-program objects, including various suits and training equipment, a constellation of satellites hanging from the ceiling, a full-scale model of a Mars rover, a copy of one of the gold records that is currenly en route to interstellar space aboard the Voyager spacecraft, and all kinds of other tom-coolery. 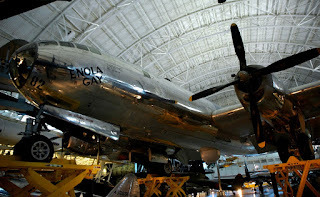 For me, space beats sky, fiction beats fact, and future beats history, but even I can marvel at something like the Enola Gay . That’s the bomber that dropped the H-bomb on Hiroshima. And created Godzilla. It’s a surprisingly shiny, happy-looking little plane for all that. It’s strange to think that it held within its steel bowels one of the probable catalysts of the eventual desctruction of our species. Don’t be sad. Embrace the Apocalypse. The aircraft collection also includes various fighter planes, stunt vehicles, some Nazi aircraft, a few record-setters, and a prominent Concorde passenger airliner. 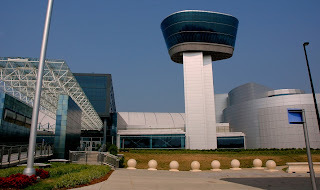 Another main feature of the museum is a mock-up of an airport control tower set up in an actual tower, where you can ascend into and pretend to direct little green dots full of helpless people safely to the ground or watch planes landing and taking off from nearby Dulles International Airport. There’s no filler in this museum, really. Just a bunch of really cool stuff that we’ve tossed into the air and higher since the Wright Brothers. If only the museum would get a site-specific Happy Meal toy in their in-house McDonalds, there’d really be no contest between it and the Air and Space Museum.